Finns know how to have fun and when they party they do so seriously. 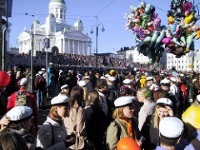 The best party of the year in Helsinki, particularly for students, is the May Day celebration. Although neighbourhoods throughout the city celebrate to herald the arrival of spring in their own way, the main event takes place in Market Square and along the Esplanade, where crowds gather in the early evening of 30 April (Walpurgis Night) to watch the statue of Havis Amanda adorned with a white cap. Champagne is sprayed over the mermaid statue, launching the festivities which take the form of an exuberant street party continuing well into the night. This is a genuinely fun and festive time to be in the city which comes alive after the long winter and the enthusiasm of the locals is infectious. Every year, the festival takes place on the same dates. For more information, contact the Helsinki City Tourist and Convention Bureau.